Beautiful mini teardrop mirror with long and short stem. Interchangeable stem has a countersunk mounting hole on both sides. 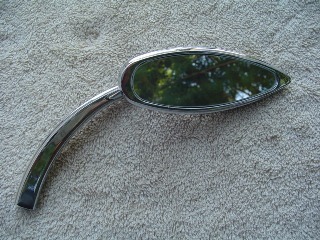 The stem can be bolted to the mirror from one side and it will make it a left side mirror. Simply flip the stem over and bolt it to the mirror from the other side and you have a right side mirror.